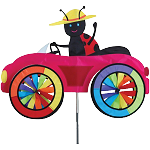 We have a huge selection of kites, yard spinners, house and garden flags, and windsocks. Everything is all-weather and fade resistant. Choose from our best sellers below or choose a category from the menu bar. Get Zen Again!